It was super simple and fast to do, I actually did it on my lunch break :-P Now I want to try it with different colors, not that I would actually wear this for more than a day or so! For the base color I used a Pink polish I already had on for a couple of days, post on that coming soon :), then just add the beads which I picked up at Michael's! All I did was mix them in a lil bowl then pour them over my nails while there was still a fresh coat of polish! Neat and gorgeous! I love the color combo, so springy!! I love the colors in this. Definitely better than the single color ones I've seen! Your combination and neatness makes this really appealing! It's me again :). I know that I'm not the first who gave you it, but I also gave you the Blogger Appreciation Award :). How difficult was this to take off? How annoying were the beads on your nails? DId they fall off easily? 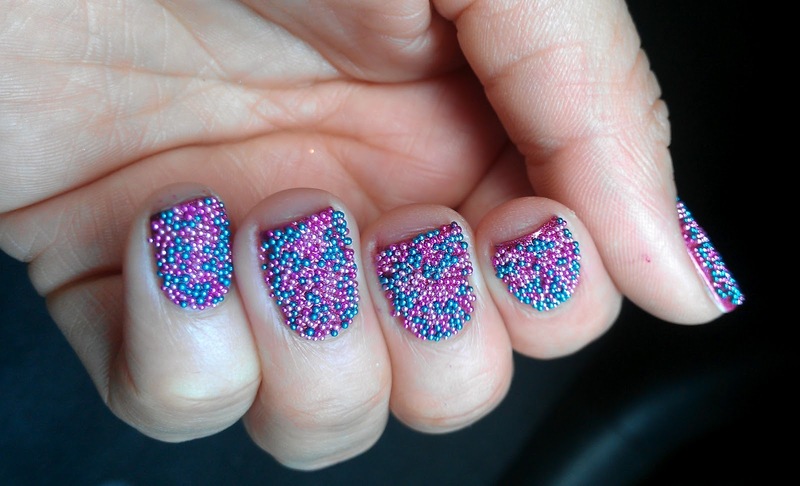 Well I only had it on for the afternoon, and I think since I didn't press hard when i did the beads on my nails a lot of them fell off on their own, then I just picked the rest. It was not as annoying as I thought it would be, I pictured them bulkier than they were! I would probably wear this for max 1 day, I don't think I could do more..
what can I say ... I have pure talent.. buahahha yeah I would had never tried this if it wasn't for you.. thanks a lot bish! How cute!! 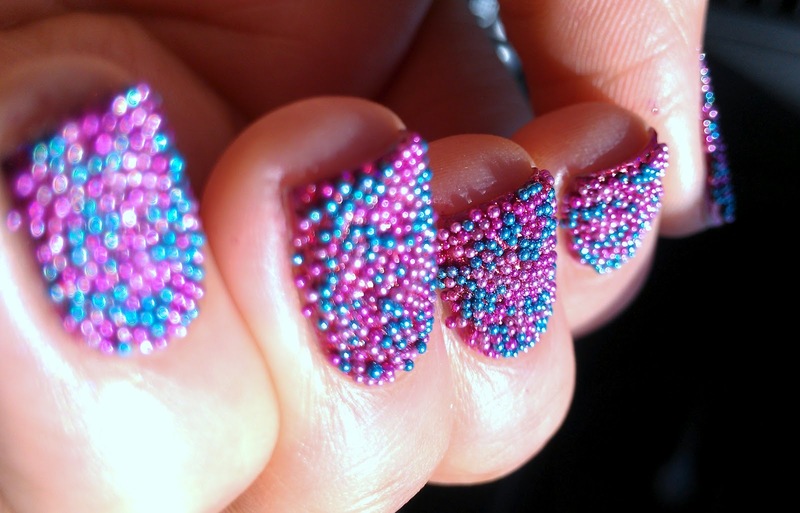 I've seen this "caviar" look done in white and in black, but I definitely like it more in color! I love the color of the beads you used! 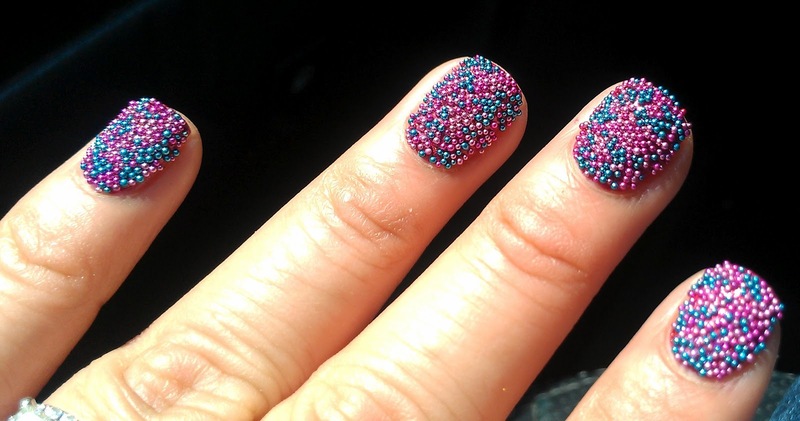 I have been seeing a lot of the fish egg mani. I am really going to give this a try! I love this! I think it would drive me nuts though, I tend to touch my nails a lot! I have to say that seeing this look more and more makes me like it more and more. Yeah I kept seeing them, but I figured I would never wear something like it, but had to try it! 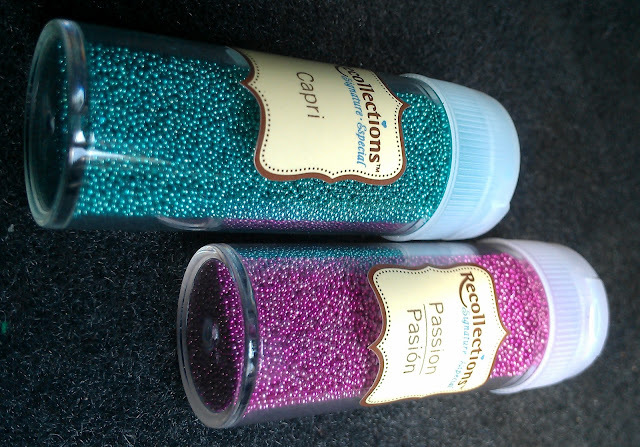 I actually kept dropping lil beads on my desk, but I didnt press on them hard enough when I applied them, I got to the hang of it by the time I was doing my pinky nail so thats the one that stayed intact longer. oo I love it! Howlongdoes it last and no top coat? wow these are amazing! i love those colors together! Don't all tbose beads kind of get in the way? The effect is stunning, though. Adorable!! I love the two colors together! i LOVE this look. the colors you chose remind me of candy shop but in 3d lol. looks great! omg this looks so cool! I love the way this turned out! It seems so effortless and it looks amazing! Aweeeeeeee!!!! 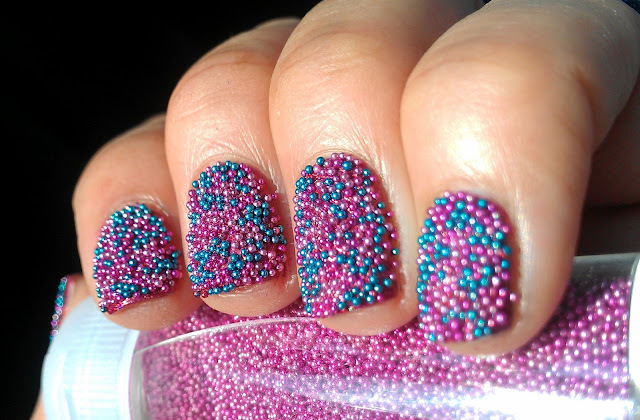 I love how you mixed pink and blue for the caviar mani (uhm, yeah, fish eggs, ROFL). Yours is one of my favourite I've seen these days! !